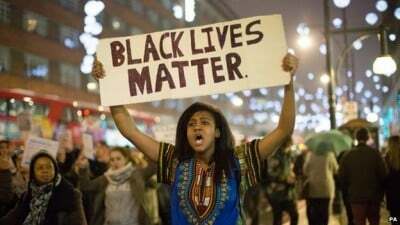 Black Lives Matter: Investigating the Culture of Impunity of Racist Police Violence in the U.S.
February 26, 2012. Sanford, Florida. Trayvon Martin, an unarmed 17 year old African-American high school student was fatally shot in the gated community in which he lived, by an armed neighbourhood watch coordinator named George Zimmerman. Zimmerman had profiled and pursued Martin. On Saturday July 13, 2013, Zimmerman was found not guilty of Second Degree Murder and acquitted of the charge of manslaughter. August 9, 2014. Ferguson, Missouri. Michael Brown, an unarmed 18 year old African-American was shot up to 8 times by white police officer Darren Wilson. Some witness testimony claimed Brown had his hands up in surrender (leading to the familiar protest slogan “Hands up! Don’t Shoot!”) Brown’s killer was cleared of all charges that he had violated Brown’s civil liberties. November 22, 2014. Cleveland, Ohio. A twelve year old African-American Tamir Rice, armed with a non-functioning replica of a pistol, was shot to death by two police officers within seconds of them arriving on the scene. The officers did not administer First Aid immediately after Rice was shot, and he succumbed to his injuries the following day. July 17, 2014. Staten Island, New York. A 43 year old father of six, Eric Garner, died after being placed in a choke hold by arresting officer Daniel Pantaleo. Video of the arrest showed Garner saying “I can’t breathe!” The Garner family received a $5.9 million settlement from the city of New York for damages related to his death which was ruled a homicide, yet a local grand jury declined to bring charges against the officer responsible. November 15, 2015. Minneapolis, Minnesota. A 24 year old African-American man Jamar Clark was shot by two police officers. Eyewitnesses claimed Clark was restrained, unarmed and not resisting at the time he was shot. The incident inspired activists to set up a protest encampment outside the city’s fourth police precinct, which was removed by police on December 3rd. These are just a few of the more spectacular incidents of African American deaths which have sparked outrage among anti-racist activists all across the United States. The pattern suggests a tendency among law enforcement to persecute Blacks more often than Caucasians. This perception was partially confirmed in March of 2015 when a Department of Justice report determined that the Ferguson Police Department routinely violated the constitutional rights of its Black residents. How have these events come to pass in 21st Century America? This is the subject of this week’s Global Research News Hour program. Following a rundown of the Global Research website’s more popular articles, we hear from Michelle Gross of the Minneapolis-based watchdog Communities United Against Police Brutality. She outlines some of the history of persecution of people of Colour in Minneapolis, the futility of relying on Grand Jury indictments, the involvement of White Supremicist groups in the city, and an interesting strategy proposed to restrain officers from further violations of the rights of vulnerable citizens. Then we speak with outspoken essayist, columnist and editor of Pan African Newswire, Abayomi Azikiwe. He explores the history of Black repression by US Law enforcement more generally, the successes and failures of past Black Liberation movements, and what it will ultimately take to root out the blight of racist violence by State authorities.